Concept Dental Centre is proud to provide comprehensive dental care for patients of all ages. We encourage our patients to value their oral and general health through information and example. Even our youngest patients need to understand the value of good hygiene and care and steps taken today will benefit your child's health tomorrow. Simple things like regular brushing, flossing and general care will ensure that all members of your family benefit from increased dental health as well as saved time and money. Magnification is an integral part of Concept Dental Centre. 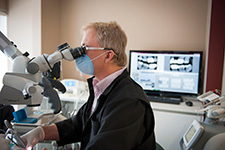 In fact, our office was the first in BC to use a microscope in a general dentistry setting. Dr. Rickards is always found wearing magnification loupes during an examination or procedure, and Surgical Operating Microscopes can be found in both work rooms. These technologies provide magnification of up to 20 times, showing discrepancies that could have remained unseen by the naked eye. There are many advantages to magnification technology. You will notice that your hygienist also wears magnification. If you are having a root canal there is a greater chance of locating "extra" canals within a tooth. Some canals can be less than one-tenth of a millimeter in diameter, and missing one of these can mean the difference between success and failure in the long-term. "I cannot overemphasize what a huge difference using a professional microscope does for optimizing my capabilities as a dentist. I have used many degrees of magnification and recently I have added a Zeiss motorized microscope. This device allows me to use incredible magnification throughout virtually all steps of the procedures I perform in my main work operatory. What this means for my patients is that I can do a better job with greater comfort to the patient". Air abrasion is an innovative restoration option offered at Concept Dental Centre. It is a minimally invasive filling technique where small areas of decay con be restored without using traditional hand pieces such as the drill. The technology uses compressed air to gently blow an aluminum oxide powder stream through fine tips and remove decay from the healthy tooth structure. Icon is a new treatment technique that is available at Concept Dental Centre. It is used to stop the progression of early decay without the use of traditional hand piece methods such as drills when early stages of decay between the teeth are detected by an X-ray or other diagnostic tool. Icon is gently placed on the affected tooth using a three part gel system. The treatment gently fills and seals the tiny holes made by the decay and stabilizes the tooth structure. This process prevents the decay from progressing any further and in most cases the tooth does not need any further treatment. The treatment can be done between the teeth as well as on smooth surfaces. Overview of common Dental "Problems"
People are typically aware of the first two situations however, the third "Occlusal Disease" is far less commonly known. Patients and dentists regularly face the following problems, we will discuss a new approach that could revolutionize treatment. Decay. This is something we are all familiar with. Decay is caused primarily by bacteria. We can treat and fix decay by placing fillings and crowns, or with things like fluoride to help remineralize slightly decayed teeth. Overall, decay is an ongoing battle that for the most part, between the cooperative patient and the dentist, can be controlled. Gum disease. This also we are familiar with. This is where, due to a variety of reasons, people lose bone around their teeth, often causing loss. Occlusal disease. This is the one that most patients are not really aware of and for dentists, it is the most perplexing to treat or manage. Basically, Occlusal disease is where the patient clenches and/or grinds their teeth at night causing damage. Let me give you some examples. Patients whose teeth "just break", even when eating soft things, for no apparent reason. 90% of the time this happens with someone who is a clencher/grinder, the tooth over time has become weakened (often by decay, ie teeth with large fillings). These teeth can just fracture or can present a problem in numerous ways: being cold sensitive ( this is because the nerve in the tooth is irritated by the trauma of grinding), hot sensitive (same reason), pressure sensitive ( this is because the ligament surrounding the tooth has been bruised by the clenching forces) or all of the above. Typically less than a few teeth will present with this problem initially because this tooth is being hit more heavily than the others. Once adjusted or fractured, another tooth will likely bear the brunt of these clenching (Occlusal) forces. Patients whose teeth move for no apparent reason. Heavy Occlusal forces can cause tooth movement. Patients whose teeth wear down. Bear in mind that when you eat your teeth do not actually touch, they come close but don't touch. Only if you are eating a great deal of abrasive foods can you wear your teeth down with food. The reason people wear their teeth down is because of the night time grinding. Jaw joint problems, commonly referred to as TMJ problems. These are most commonly caused by night time clenching/grinding. The symptoms vary from locking jaws, clicking jaw joints, pain in the joint, muscular headaches which can radiate to other areas. If someone has heavily restored teeth, lots of fillings, these teeth are considerably weaker than a healthy intact tooth, simply because a lot of it's original tooth structure is missing. It has been filled with filling materials but these do not impart the same strength to the tooth as the original tooth structure did. If the owner of these teeth is not a clencher or grinder, then these fillings will likely last a long time depending upon the patients oral hygiene. However, if the owner is a clencher/grinder then likely fractures will start to occur, followed by a recommendation of crowns to protect the biting surface. Unfortunately, the patient still grinds heavily. This will likely result in wearing through the crown if it is metal or gold (over time), chipping if it is an older generation porcelain, or even tooth movement and/or sensitivity to temperature and/or pressure. If the patient has underlying gum problems, clenching/grinding can worsen the situation considerably, causing accelerated tooth loss. The best way to imagine this is to imagine a stick planted firmly in the ground. If you rock that stick back and forth every night, it will start to become loose and a little well will occur around that stick. The same things happen to your teeth. If the patient is not a clencher or grinder then they will likely respond to conventional treatment with greater predictability. Remember, the dentist is trying to get tissues to readapt or attach to your tooth, if the tooth is being rocked regularly, this process will be interrupted. In both these situations, the future for these teeth is EXTREMELY dependent upon the forces placed on these teeth. Someone clenching at night can generate 10 times the forces that they would ever allow themselves to generate while conscious. More bad news! For those people who are regular clenchers things get worse over time. Every time they clench for a while they are exercising their closing muscles. Like any other muscles that you exercise regularly and aggressively, they get bigger and stronger. These individuals usually are broader in the mid to mid lower face than when they were younger... they have well developed their masseter muscles over the years. What can happen over time is their muscles get stronger, meanwhile, they have often lost some back teeth and they have fewer and fewer teeth to support and share these forces. Things just get worse more quickly. » What can one do?